Once you have successfully created a class in Khan Academy, follow these steps to get your students to join so you can monitor their progress and pull reports. 2. At the top right of the screen, choose "Log in"
3. 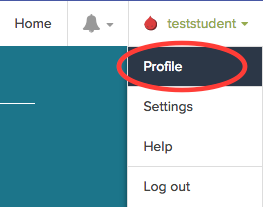 Choose "Log in to Khan Academy with Google"
5. If students are presented with the following message, have them click "allow"
6. Have students choose their grade level from the dropdown menu and then click "Done! Keep learning." 7. Students may then choose an avatar and click "Save"
Note : Avatars with locks can not be chosen, they can be unlocked with their progress through the program. 9. On the Profile page, have students choose "Coaches"
10. On the coaches page, have your students type in the Classroom code that was generated when you created your class. They can then click "Join the class". You can now monitor your students progress and change the subject for your class.